Page moved! This web page is no longer updated. I have successfully defended my PhD thesis at NTUA and I have moved to UCLA as a postdoctoral scholar. Please visit my new web home page. I am a CVSP group member, working towards my PhD in the areas of image analysis, computer vision, and multimodal processing. 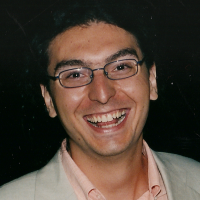 My PhD thesis advisor is Prof. Petros Maragos. I completed my undergraduate studies in the ECE school of NTUA in 2003, also working for 18 months (2001-2003) as a research assistant at the Institute of Informatics & Telecommunications (IIT), Demokritos National Center for Scientific Research. During the summer of 2006 I visited Prof. Anil Kokaram's Sigmedia group at Trinity College Dublin, Ireland. Here is my CV. I successfully defended my thesis in July 2009 and in October 2009 I moved to UCLA as a postdoctoral fellow, joining Prof. Alan Yuille's group. Please visit my new web home page. We have recently organized at NTUA a one-day workshop in Athens, whose topic has been digital technologies applied to cultural heritage applications, focusing on Akrotiri, Thera. I have been working on PDE and wavelet-based techniques for the digital restoration of missing parts in paintings. This is part of an ongoing project on the virtual restoration of the 3,600 years old wall paintings excavated in the pre-historic Aegean settlement in Akrotiri, Thera, Greece. Audiovisual speech recognition refers to the problem of recognizing speech by lipreading. We have developed highly adaptive multimodal fusion rules based on uncertainty compensation which are compatible with synchronous and asynchronous multimodal interaction architectures. Further, our work on AAM-based face representations leads to highly informative visual speech features which can be extracted in real-time. We investigate multigrid techniques for the solution of the time-dependent PDEs of geometric active contour models in Computer Vision. The method allows interactive solution of models whose numerical implementation with conventional techniques has been prohibitively slow. We focus on recovering aspects of vocal tract’s geometry and dynamics from speech, a problem referred to as speech inversion. In our inversion scheme ambiguities inherent to audio-only inversion are resolved by also exploiting visual information from the speaker’s face. We consider optimal scale selection for fully automatic image denoising in nonlinear diffusion or morphological scale-spaces. The problem is studied from a statistical model selection viewpoint and we employ cross-validation statistical techniques to address it in a principled way. IEEE Transactions on Image Processing, vol. 18, no. 8, pp. 1724-1741, Aug. 2009. IEEE Transactions on Audio, Speech and Language Processing, vol. 17, no. 3, pp. 423-435, Mar. 2009. IEEE Transactions on Audio, Speech and Language Processing, vol. 17, no. 3, pp. 411-422, Mar. 2009. IEEE Transactions on Image Processing, vol. 16, no. 1, pp. 229-240, Jan. 2007. Proc. IEEE Int'l Conf. on Image Processing (ICIP-09), Cairo, Egypt, Nov. 7-11, 2009. Proc. IEEE Int'l Conf. on Image Processing (ICIP-08), San Diego, CA, U.S.A., Oct. 12-15, 2008. Proc. 16th European Signal Processing Conference (EUSIPCO-08), Lausanne, Switzerland, Aug. 2008. Proc. IEEE Int'l Conf. on Computer Vision and Pattern Recognition (CVPR-08), Anchorage, AK, June 2008. Proc. IEEE Int'l Conference on Acoustics, Speech, and Signal Processing (ICASSP-08), pp. 773-776, Las Vegas, NV, U.S.A., Mar.-Apr. 2008. Proc. IEEE Int'l Conference on Acoustics, Speech, and Signal Processing (ICASSP-08), pp. 2237-2240, Las Vegas, NV, U.S.A., Mar.-Apr. 2008. Proc. IEEE Workshop on Multimedia Signal Processing (MMSP-07), pp. 264-267, Chania, Greece, October 1-3, 2007. Proc. IEEE Workshop on Multimedia Signal Processing (MMSP-07), pp. 457-460, Chania, Greece, October 1-3, 2007. Proc. Int'l Conference on Spoken Language Processing (ICSLP-06), pp. 2458-2461, Pittsburgh PA, USA, Sep. 17-21, 2006. Proc. 14th European Signal Processing Conference (EUSIPCO-06), Florence, Italy, Sept. 4-8 2006. Proc. Int'l Conf. on Image Processing (ICIP-05), Genova, Italy, September 2005. Proc. IEEE Int'l Conf. on Computer Vision and Pattern Recognition (CVPR-05), San Diego, CA, June 2005. Proc. IEEE Int'l Conf. on Computer Vision and Pattern Recognition (CVPR-04), Washington DC, June 2004.
in Multimodal Processing and Interaction: Audio, Video, Text, edited by P. Maragos, A. Potamianos, and P. Gros, chapter 4, pp. 111-126, Springer-Verlag, New York, 2008.
in Multimodal Processing and Interaction: Audio, Video, Text, edited by P. Maragos, A. Potamianos, and P. Gros, chapter 1, pp. 3-48, Springer-Verlag, New York, 2008. ECE School PhD Thesis, 2009. Thesis supervisor: Prof. P. Maragos. ECE School Diploma Thesis, 2003. Thesis supervisor: Prof. P. Maragos. GAC++: A toolbox for geometric active contours and other related PDE-based computer vision models. See here. AAMtools: A toolbox for building Active Appearance Models and fitting them to still and moving images. See here.